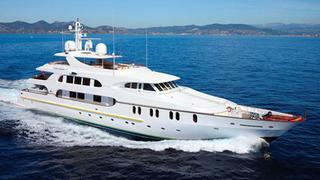 News in from Ken Burden at Fraser Yachts that he's listed the 49.75m superyacht Shu She II for sale. Designed by Studio Scanu and built to Lloyd's class by Italy's CRN yard in 1998, she was recently refitted in 2013 to the highest standards. MCA compliant, Shu She II accommodates 10 guests in a master suite, two double staterooms and two twin cabins. She is equipped with a zero-speed stabilisation system for a smoother, more enjoyable cruising experience underway. Powered by twin Caterpillar 1,978hp diesel engines, Shu She II is capable of a top speed of 18 knots, and she comfortably cruises at 16 knots and has a range of 4,000 nautical miles. Shu She II is asking €9.9 million.